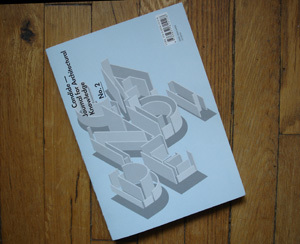 In this and the next issue of Candide you will find the best contributions presented at the conference “Constructing Knowledge,” convened in November 2009 at RWTH Aachen University by the Department of Architecture Theory. The two-day event brought together a wide spectrum of perspectives on the question of architectural knowledge. More than one hundred academics and practitioners had responded to our call for abstracts, of which sixteen werevselected for oral presentation, and an additional twenty werevchosen for display as a poster. Of the papers presented, those we deemed the best have since been revised by the authors for publication in Candide. Further conference contributions will be made available as digital proceedings. To us, the editors of Candide, the conference was a test run in the process of peer reviewing, one of the journal’s main raisons d’être.